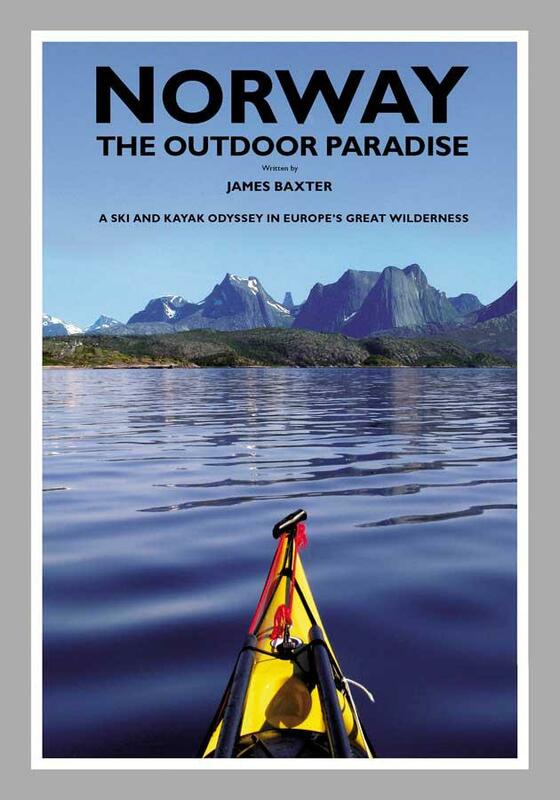 Subtitled A Ski And Kayak Odyssey In Europe’s Great Wilderness this book tells the story of an amazing outdoor adventure. The author spent four months skiing 2,700 kilometres south to north through Norway and Sweden and then turned round and spent another four months kayaking back some 3,100 kilometres round the coast. That is an extraordinary achievement, especially given Scandinavia’s winter weather. Having done a great deal of skiing there I know what conditions are like and that a journey starting on January 1, as James Baxter did, means dealing with short daylight hours, bitter cold, blizzards and deep snow plus the weight of a pack loaded down with winter equipment. I wasn’t surprised to read that he set off with a 120 litre pack that weighed 28 kilos. This is a big book, 450 pages in total, and I have to admit that I have not yet read the kayak section, this not being something I am very interested in. I enjoyed the skiing section though, as I think anyone interested in mountain journeys, ski touring or Scandinavia would. Detailing his experiences day by day the book is an exhaustive account of the trip and through the author's account you learn about skiing in difficult conditions, camping in the snow, snow shelters and more. There is much about the author’s physical state but surprisingly little about his mental one, given what he had to cope with. Whilst the landscape lies at the centre of the book he also describes the places he passes through and gives many interesting snippets of Norwegian nature, geology, culture and history. There are also a series of meetings with people along the way, including some who ski with him and the many who helped him. Each chapter has a map with each days stage marked on it, a great help in following the journey. There are hundreds of photographs too, showing everything from details of camps to vast landscapes. These pictures are all fairly small. It would have been nice to see some of the more spectacular ones in a larger size. Baxter says that the book is intended to be an account of his adventure and also a guidebook. There is certainly enough information in the ski chapters to use these for planning a tour with details of the route, huts and other essential information. The author also wants to promote Norway, hence the phrase ‘The Outdoor Paradise’ in the title, and I think he does this well. Having spent many months there myself, including undertaking a south to north walk roughly along the same route as Baxter’s ski tour, I’ve always felt that both Norway and Sweden are under-rated in Britain, especially by walkers. The landscape is dramatic, beautiful and challenging and on a vast scale. Reading this book made me want to go back. I recommend it. Wow. 450 pages is big. But still it seems an interesting read. Especially when I want to visit there in the future.